Today there were two NoG20 solidarity demonstrations in Germany. Tomorrow there will be another demo in Berlin. 44 people are still imprisoned after the NoG20 protests. On a spontaneous demonstration in Bremen, activists demanded to stop the repression against all NoG20 activists and showed solidarity with the Rote Flora social center. Again and again politicians are threatening to evict the Rote Flora since the NoG20 protests early July. In Hamburg more than 1000 people took the streets to protest against police violence and the formation of an authoritarian society. Protesters chanted to release all prisoners and to stop repression. Many people also showed solidarity with Rote Flora, which is under eviction threat. At Jungfernstieg cops with machine guns came near to the demo, it seems that the police state wants us to get used to fact that cops with machine guns at and around demonstrations are now getting “normal” in Hamburg. Today there was also a meeting of the Schanze district council. Many inhabitants of the district attended at the meeting. Many of the people living in the area critized the police and politicians. They stated that they dont want an eviction of Rote Flora, that mayor Olaf Scholz should leave and warned attending deputy mayor Katharina Fegebank that they will remember what she said tonight. Attending politicians continued their fairy tales about the mob, but inhabitans of the Schanze district insisted to speak about police violence. The lack of confidence in the state and politicians is huge after the NoG20 police operation and the lies and rumours that were spread by police and politicians. The interior commission of the Hamburg senate also had a meeting today. Cops and state officials continued with their disinformation campaign, which they started months ago. But the pressure on mayor Olaf Scholz and police authorities is rising and even German mainstream media is asking more and more questions about police violence and disinformation by the authorities. Panorama, a program at public TV broadcaster ARD, released a video (Video in English with German subs) today with an interview with 4 Russian media- and human rights activists who belonged to the “dangerous” group which police authorities used to justify the deployment of SEK and COBRA anti-terror squads with machine guns on July 7. Cops beaten and kicked at least one of the activists, who were not taking part in the protests, but where there to observe and film the protests. The activists where arrested but released again without any charges. Tomorrow there will be a solidarity demonstration in Berlin. 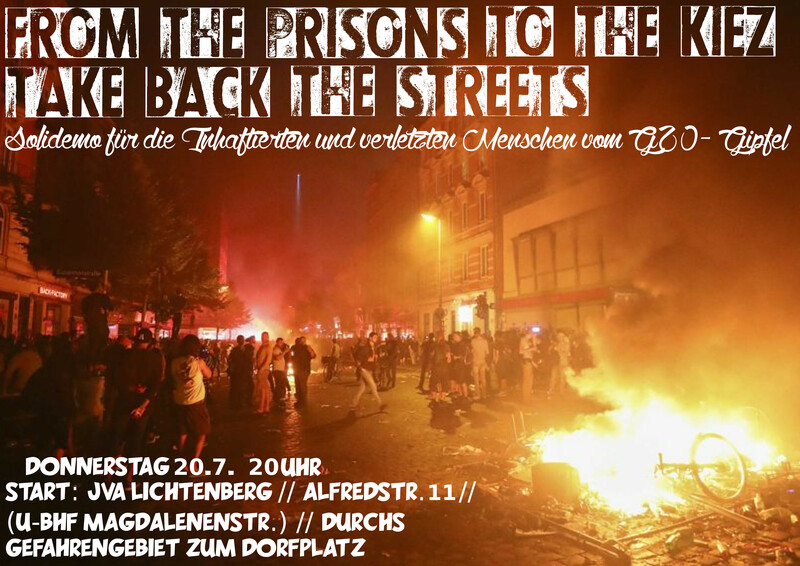 The demo will start at 08:00pm at JVA Lichtenberg (Alfredstr. 11 // U-Magdalenenstraße) and will march to Rigaer Straße corner Liebigstraße. On July 22 there will be a NoG20 anti-repression and solidarity with Rote Flora event in Gothenburg, Sweden. More information; here.